Mark Smith (right), one of the stars of the Stevenage side of 1996. FOOTBALL in Stevenage had a chequered history before a new club was formed from the ashes of Stevenage Athletic. As a town with a big working class population, many of whom had some form of affiliation with London clubs, Stevenage was ripe for footballing expansion. Like most new towns, there were teething problems in establishing a club with a local identity, but in 1976, Stevenage Borough took its first steps towards bringing the Football League to the northern corner of Hertfordshire. In June 1990, a little-known Scouser named Paul Fairclough was appointed manager and from there, the meteoric rise of the club took place. In his first year in charge, Stevenage Borough won the Isthmian League Division Two North by 25 points, scoring 122 goals in 42 games. A year later, Borough won the first division by 14 points, scoring 95 goals in 40. After a year of adjustment in 1992-93, which included introducing more finesse to a robust and direct team, Fairclough led Stevenage to promotion to the Conference. Fairclough’s gift was extracting the best qualities out of players who had not realised their full potential. Mark Smith, signed from Hitchin Town, was one such player. Fairclough converted him from a striker into one of non-league football’s best central defenders. In addition to Smith, Fairclough built his team around a number of outstanding individuals. In goal he had Richard Wilmot, returning to the club after spells at Scunthorpe, Halifax and Hitchin, and the under-rated Des Gallagher. Smith was paired in defence by flamboyant Nigerian Efetobore Sodje, a confident character who played with a colourful headband. Full backs were Robbie Mutchell and Kenny Webster. In midfield, Liverpool-born Steve Berry, an experienced player who had appeared in the Football League with – among others – Portsmouth, Sunderland and Northampton, ran the show, along with Paul Barrowcliff, Stuart Beevor and Tony Lynch. Up front, Stevenage had Barry Hayles, who had been signed from Willesden Hawkeye in 1994. His strength and goalpower were to prove pivotal in Stevenage’s success. Other forwards like Dave Venables, Neil Trebble, Gary Crawshaw and Corey Browne gave Fairclough a number of options. After a bedding-in season in the Conference in which Stevenage finished fifth, the 1995-96 season was one of triumph for the club. But it was a success that Fairclough himself called “hollow” as the club was denied the chance to move up to the Football League due to their ground, Broadhall Way, not meeting the required standard. The club knew the ground would not tick every box. Indeed, in October 1995, it was announced that if Borough won the Conference, they would not be going into the League. This didn’t deter the players and from November 25, when they beat Runcorn 8-0, to March 25, they were unbeaten. The wins kept piling up, including a 4-0 win against rivals and reigning champions Macclesfield and over Easter, favourites Woking were beaten by a similar scoreline. They ended the season with an eight-game unbeaten run, three successive away wins – at Kettering, Bath and Kidderminster – effectively clinching the title. Fairclough became a target and in the middle of the title chase, was courted by Scunthorpe. 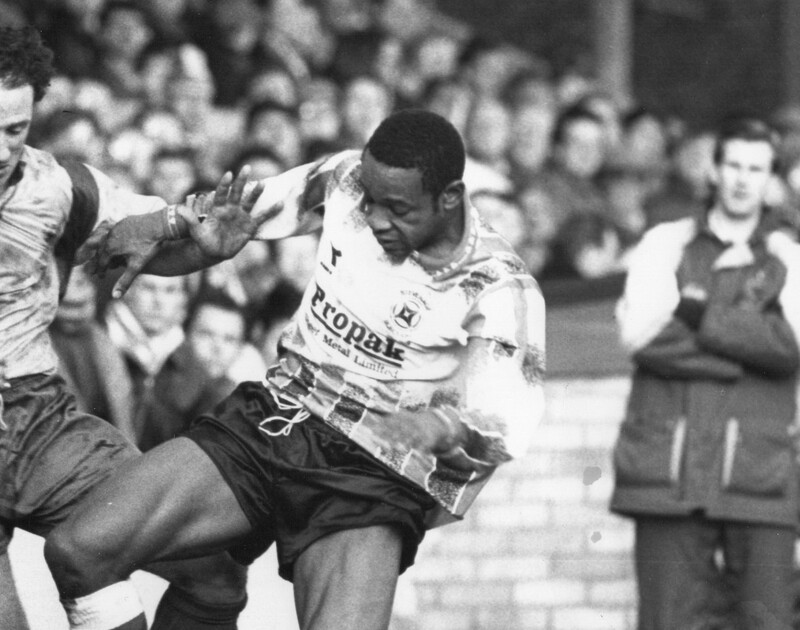 Some of Borough’s players, such as the brilliant Hayles, also caught the attention of Football League clubs. Although Stevenage were aware that the ground would hold them back, Chairman Victor Green started to lobby for the decision to be overturned. They even went to the high court and things like the Treaty of Rome and restriction of trade were mentioned in discussions. Stevenage lost their case and in some ways, the fire went out in the new town for a while, even though in 1997-98, they enjoyed a very high profile FA Cup run. Both Fairclough and Stevenage eventually found their way to the Football League, but not together. He left the club in 1998 and even had a second spell a couple of years later, but his success came with Barnet. As for Stevenage, they went up in 2010.